Although small, earthworms provide big benefits to soil by aerating it as they burrow and enriching it as they eat and excrete organic material. One myth of earthworm reproduction is that if you cut them in half, the two halves will regenerate into two new worms. 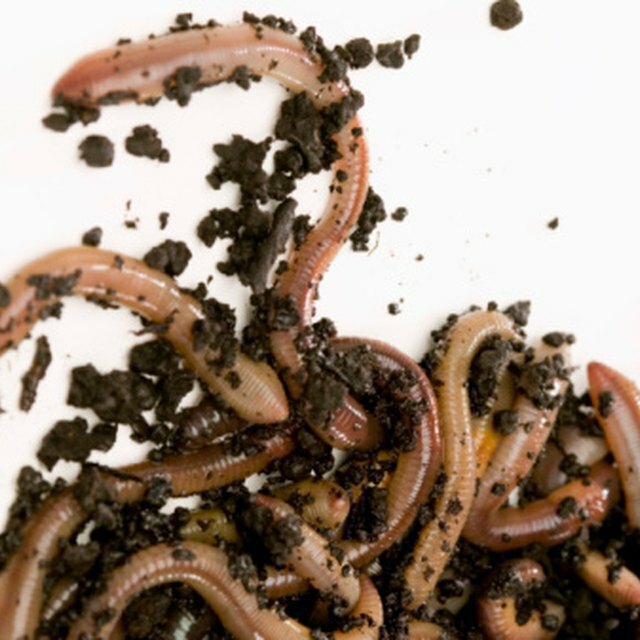 Although worms can regenerate small portions of their bodies, they do not reproduce this way. From hermaphrodites to mucous cocoons, earthworm reproductive habits are more fascinating than the myths. Earthworms are members of the annelid phylum. The word "annelid" means "small rings"; if you look closely at an earthworm, you'll see that the body appears to be surrounded by small rings. These rings are segments that keep the worm flexible and mobile. What you can't see, even on close inspection, is that earthworms are hermaphrodites, meaning they have both male and female reproductive organs. Despite this anatomy, most species of earthworms need a partner to reproduce. Near the head of an earthworm is a smooth band called the clitellum. This band normally matches the color of the rest of the worm's body, but when earthworms are ready to mate, the band turns a darker shade. 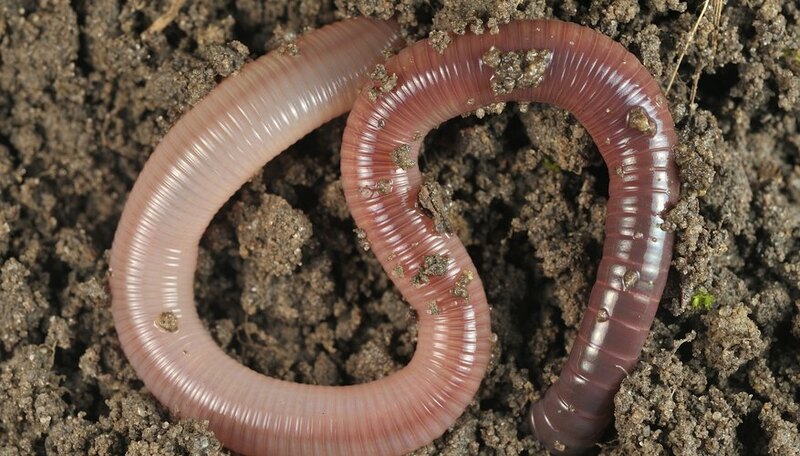 Although some species of earthworms will mate on the soil surface, this leaves them exposed to predators during this vulnerable time, so most worms mate underground. The worms are thought to find one another through the release of pheromones. Once a partner is found, the two worms line up in opposite directions so that each worm's male opening lines up with the other worm's sperm receptacle, known as the spermatheca. The worms are then in position to exchange sperm. Once the worms have lined up, the male openings deliver sperm into the other worm's spermathecae. As this happens, the clitellum of each worm secretes mucous to make a tube that fills with a protein-rich fluid called albumin. Once the sperm has been exchanged, the worms wriggle away. As they move, the tube slides off each worm's body. On its way, the tube passes the female reproductive pore and collects the eggs. The tube then slips past the spermatheca to collect the sperm that was deposited there during copulation. Once the worm has wriggled free of the tube, the tube closes off and the sperm fertilizes the eggs. The eggs then develop within this cocoon. Although cutting a worm in half won't make two new worms, some species of earthworm can reproduce without a partner. Called parthenogenesis, this form of reproduction comes in handy in habitats where partners are difficult to find or conditions are continually in flux. Parthenogenic worms are typically found in shallow soil or in decaying matter, whereas worms that mate with a partner are found in deeper soil where conditions are more stable, according to a study by the Department of Biology at the University of Rochester that was published in a 1979 issue of Oxford Journal's Integrative and Comparative Biology. Although once thought uncommon, biologists have found that the Lumbricidae family of earthworms has over 30 species of worms that reproduce without a partner. Painter, Tammie. "How Do Earthworms Reproduce?" Sciencing, https://sciencing.com/how-do-earthworms-reproduce-13406886.html. 21 July 2017.